No bagging of food & medicine! It’s safe, clean and 100% effective! Louis Pasteur discovered that heat kills organisms in the 1860's. Heat is now a simple solution to rid structures of termites. Clean, dry, and odorless, heat is fed into a containment or structure through ducting to slowly raise the contained air to a temperature that is safe for the structure but lethal to termites. With heat being able to penetrate deep inside wood, the HEATPRO process proves to be an effective non-chemical option for getting rid of termites in a whole structure. Heat is an ecological and technical break through in treating entire structures such as single family homes, apartments, condominiums, hospitals, nursing facilities, medical laboratories, offices and industrial complexes. 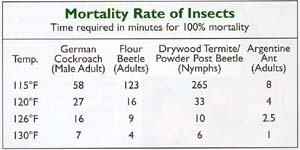 Heat eliminates drywood termites, powder post beetles, carpenter ants and other wood destroying insects. 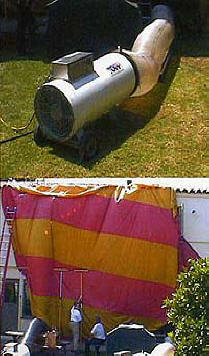 Heat treatment takes approximately 6-8 hours compared to 2-5 days for chemical fumigation. 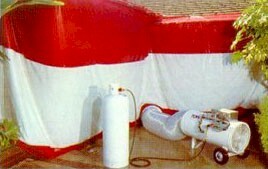 Heat can be used effectively to "area treat" local infestations in a single wall, room or unit. In a five year study of termite eradication methods ordered by the California structural Pest Control Board, and conducted by the University of California, Heat was the only Non-Chemical method to successfully treat entire structures. The process starts like a standard fumigation treatment - the house or area to be treated is completely sealed by nylon tarps (However unlike fumigation the roof is not tented and does not necessarily need to be walked on or damaged as a result). What's pumped in to eradicate the wood-eating pests isn't a pesticide gas but plain old hot air. It turns out that a 60-minute dry sauna of about 130 degrees is lethal to the little creatures, but because they live deep inside the home's wood framing, the air inside the house has to be heated to about 160 degrees for four to six hours, or until the core temperature of the heftiest wood beams is raised to 130 degrees for an hour. Customers love the idea that heat does the job like a fumigation but without the gas toxicity and the 3 day move out of their homes. To prepare your home for the heat treatment, heat sensitive items like computers, CDs, vinyl records, houseplants, plastics, crayons, candles and the like - and are stored in a "cool room" or covered with heat resistant blankets provided by Exterminetics.